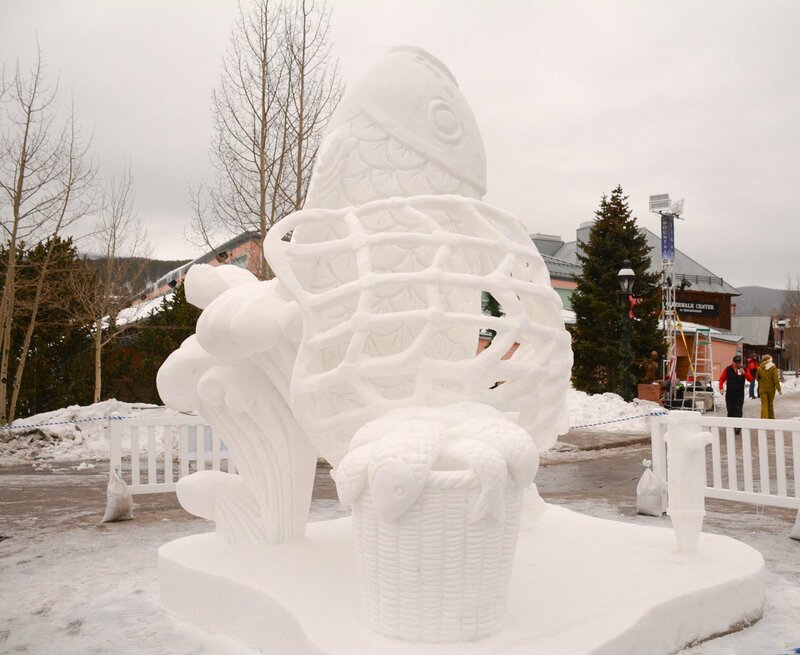 The judging of the 2015 Breckenridge International Snow Sculpture competition took place on the morning of gray day - unusual for Summit County, even in winter. The elaborate detail of the fishing net helped this sculpture win a top prize, although the judging is always difficult and often is a compromise by the team of sculpture professionals engaged by the town of Breckenridge to determine which sculpture most stretched the limit of the material - snow - and had the grace and balance, and meaningfulness that one expects to see in sculpture in any medium. Lack of shape lighting - like this cloudy day - made it harder to get a great picture of the final images but on the evening before it was easier. 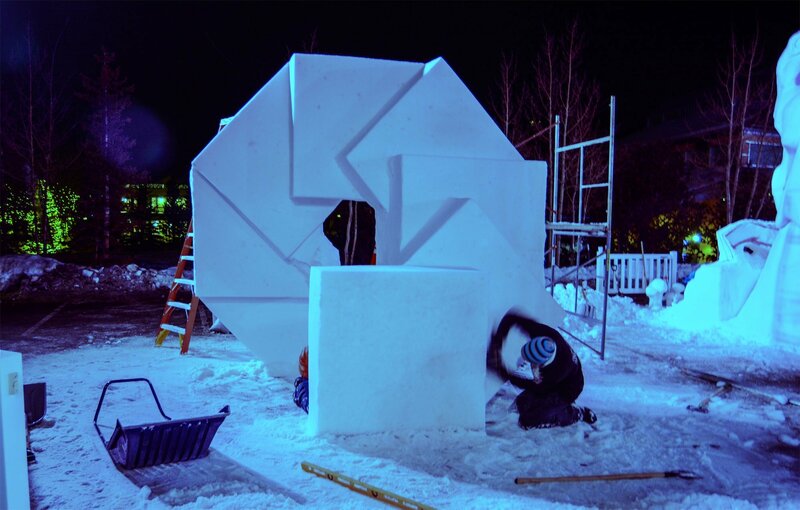 Although the scaffolding and tools are scattered around the sculpture sites, early images show the sculptors making the final detail and crisping in the cold night air. Intense lights are aim on the sculptures, so night can be a great time to view the works. 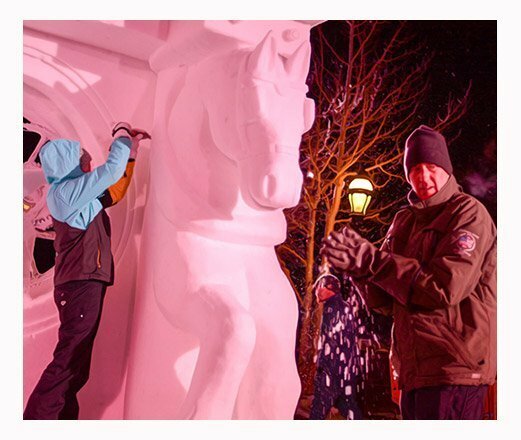 During the working week, before the judging, snow sculptors work until they are called to dinner. One the last night they are allowed to work throughout the night and until the final bell -- usually at 10 a.m. or noon. Following the end of the work week, the sculptures are left for viewing for another week. Depending on the weather conditions, some of the more delicate sculptures, sometimes the winners, don't stand for the entire following week. The changes from the weather can be interesting, and seeing the finished works on a cold winter night without all the crowds that descend on the final weekend, however, can be a very special viewing. 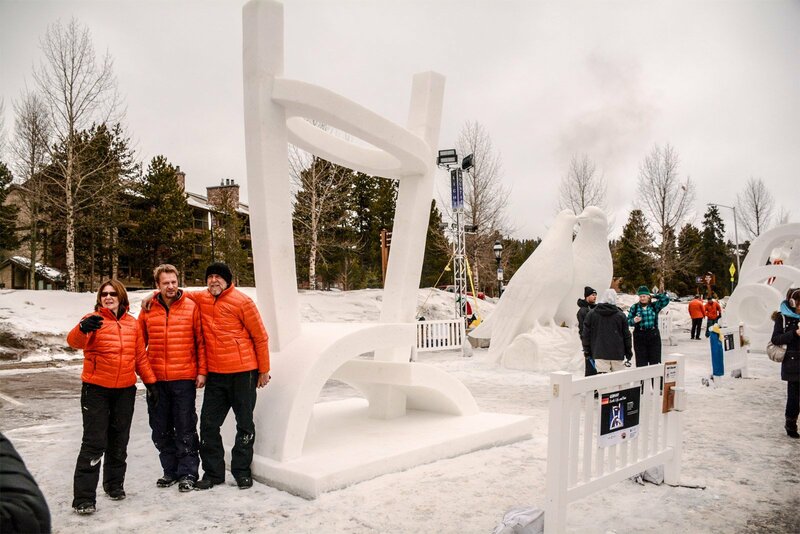 Rob Neyland and Ron Shelton are two realtors from Breckenridge Associates Real Estate who help to found the snow sculpture event in Breckenridge and for many years lead the Team Breck quartet working on one of the competition blocks. In 2015, the pair worked on a piece for one of the event sponsors.